Tougher penalties for careless driving could have serious consequences for people who drive for a living and their employers. In July 2013 a system of on the spot fixed penalties was introduced in order to reduce the costs to the prosecuting authorities of prosecuting drivers for minor road traffic offences. Initially, there seemed a marked reluctance on the part of the Police to make use of this valuable prosecuting tool but as post-election a reduction in the costs of the criminal justice system continues to be a focus for central government, use of it is likely to become more widespread as the Police grow in confidence in using it. It’s a common scenario on our roads. You’re running late for an important meeting and drive a bit too close to the car in front. Perhaps you don’t have time to stop for lunch so wolf down a sandwich while trying to steer with one hand. Or maybe you haven’t noticed the car behind flashing its lights because you’re still sat in the outside lane. Such examples of bad driving often used to go unpunished because of the bureaucracy involved in taking relatively minor offences to court. The radical shake-up of motoring law was expected to have major implications for the many people who drive for a living and the companies that employ them but as yet that has not taken effect as expected. It is difficult to evaluate how many fixed penalties have been administered for anti-social driving offences since July 2013. In Derbyshire, for example, in the first six months after the change there had been only two fixed penalties administered for lane hogging. Other forces are more proactive and it is estimated that since July 2013 tens of thousands of on the spot fines have been administered together with penalty point endorsements. Under the changes police can issue £100 fines and three penalty points for minor offences of careless driving such as tailgating or needlessly hogging the middle or outside lanes. And fixed penalties for using a phone while driving – or not wearing a seatbelt – were increased from £60 to £100. Those affected most are motorists who do a high mileage such as sales representatives, but also any professional driver is at risk due to the mileage they undertake. Anyone whose job involves racing against the clock to get from A to B is more likely to get caught out by these police powers. They could see their penalty points mount up in no time and are at greater risk of losing their licence under the totting up procedures. Some people pulled over for careless driving will just pay the fine and accept the penalty points rather than challenge the decision in court. But this could come back to haunt them. Say you have been stopped for lane hogging, for example, but had been unable to move over because you were sandwiched between other vehicles. You shouldn’t just accept the punishment because it’s expedient to do so. Dave is a coach driver for Middle of the Road Coaches. He is undertaking a journey from London to Bristol on the M4 motorway. He is in the middle lane behind another coach which is doing a similar speed to him. The other coach habitually pulls in at regular intervals but Dave decides to overtake but is never quite able to accelerate enough in order to do so. As a consequence he stays in the middle lane and the effect of the two coaches being in the two inside lines leads to a queue of traffic behind. In the queue is a Police car which ultimately, after a couple of miles, is able to pull into the outside lane and signal to Dave to pull over. The Police explain to Dave that in their view he is guilty of inconsiderate driving. Dave protests that he had no option but then decides to accept the three penalty points as he only has three on his licence at the time and they are about to become spent. A week later Dave receives a notice of intended prosecution on his doormat for another driving offence. This time the offence is one of speeding at 57 mph in a 30 speed limit. This potentially carries a penalty including six penalty points, making him a totter under the penalty points scheme with 12 points and liable to disqualification from driving. Dave now wishes that he had stuck to his guns and argued his point in court. You do however need to proceed with caution as a recent case which received some publicity in the national press shows. Ian Stephens was a painter and decorator who was pulled over on the M62 motorway for driving consistently in the middle lane of the motorway blocking six other drivers. It is not clear whether he was offered the £100 fixed penalty and three penalty points and in any event he pleaded not guilty but was convicted by Leeds Magistrates Court in June 2015 of inconsiderate driving and fined £500 with £400 costs and also had his driving licence endorsed with five penalty points. It is believed that this is the first successful conviction in a court for an offence of this nature since the change in policy was introduced in July 2013. Accepting a fixed penalty could have all sorts of negative consequences and not just those associated with the totting up procedures. Six penalty points is enough to make a big difference to your insurance premium, particularly if you do a high mileage. If you are a professional driver it could have an effect on your vocational licence entitlement. The Senior Traffic Commissioner’s statutory guidance on Driver Conduct sets out the way in which the Traffic Commissioners will view motoring offences and the effect they will have on a vocational licence. For example, new applicants for a vocational licence who have penalty point endorsements may have to wait for a further six months for the application to be granted if those points were endorsed in the six months prior to the application. 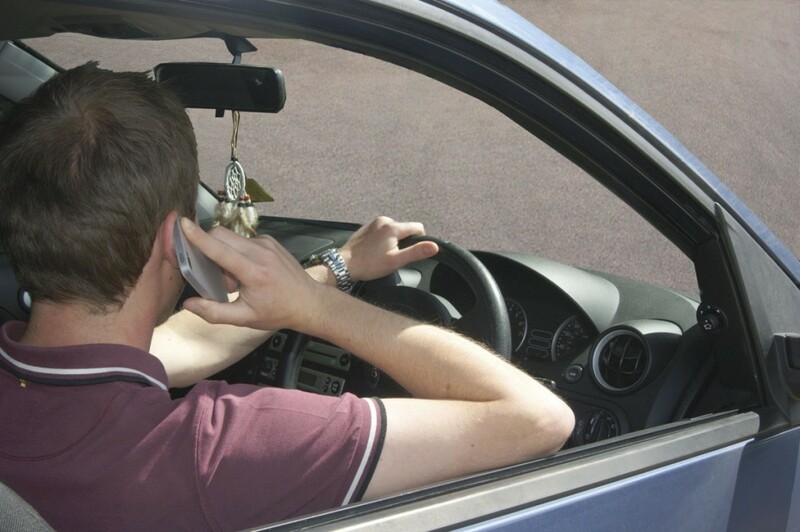 Any endorsement even by way of a fixed penalty for using a mobile telephone whilst driving, particularly whilst working, can be treated particularly severely. Dennis drives for Chat Coaches and is seen by a Police officer holding a mobile telephone whilst at the wheel of his coach in a queue of traffic. The officer speaks to Dennis who explains that it was a (now disembarked) passenger’s phone that had been left on the coach floor and that it had rolled into the aisle next to him. He had merely picked it up in order to put it somewhere safe. Dennis is offered a fixed penalty fine of £100 and a three penalty point endorsement which he decides to accept as he cannot be bothered to argue the point. To his surprise Dennis is called up to appear before the Traffic Commissioner regarding the offence and why he failed to report it to her. He is even more surprised when his vocational licence is suspended for 21 days. His Boss Barry tells him that this is a disciplinary matter and that his job could be in jeopardy as he may consider this gross misconduct. The effects of fixed penalty convictions can be significant and to the PSV driver much more than a mere three points on the licence, especially if you are caught using a mobile telephone whilst driving. However, that’s not all. The next time you are stopped for a similar offence you are more likely to be prosecuted and found guilty as the Prosecution may use the fact of the previous offence against you, or if the evidence seems equivocal, the fact you have a previous conviction may tip the balance towards the Prosecution proceeding where they otherwise might not. So if you drive for a living – or employ people who do – you should be mindful of that it is likely that in the coming months there will be an increased emphasis on ‘on the spot’ fines and penalty points and that you would be well advised to adjust your behaviour accordingly. Make sure your staff are also made aware of the potential pitfalls of inconsiderate driving. And if you are facing a driving ban you should seek professional advice straightaway. Losing your licence can have serious consequences, damaging both your career prospects and your livelihood. Efficiency, understanding and communication. This article is for guidance only. The law and practice referred to has been paraphrased or précised and should not be construed or relied upon as legal advice.